The belly of the pool is one of its sheltering lies. A sheltering lie is under something, and out there on the bottom, the fish is under a lot of water. Very often when one hooks a fish in the shallow edges, up in the throat, or down at the tail, the fish’s first response is to head for the deepest part of the pool. When the line comes tight, and the fish feels that pressure, it runs off to a sheltering lie (or the shelter of a prime lie). Knowing that this will be the fish’s response is the first step in understanding how to fight fish (much more on the strategies of fighting fish in my forthcoming book, The Angler as Predator). The fishing in the belly of the pool may or may not be any good. It depends on water depth, the shape of the pool, the presence of vegetation, bottom structures, and any bank structures that might provide cover. In smaller streams, where the only water of any depth is in the pool’s belly, the entire belly may be one giant prime lie. In fact, it may be the prime, prime lie. On small streams the water at the head of the pool and in riffles, flats, and other stream features is usually too shallow to form prime lies. Feeding lies yes, but prime lies, no. For example, on many of the small- to medium-sized streams in Alaska, rainbows will frequently hang out all along the length of the pools. These are usually faster water pools that may drop off to depth gradually, or pools where there are plenty of fallen trees, brush, and grasses to offer protective, overhead shelter. On the other hand, on huge waters, where the belly is very deep and slow with wide shallow edges, it may be hard to locate any feeding fish unless there’s something to get them out into feeding lies. Although there will be fish in the deepest waters, they are usually quite spread out, Probing the very deep, bottom of the pool can sometimes be successful, but in such big rivers, it’s usually more productive to seek specific feeding areas or prime lies. We’ll look at some instances below. If the edges of the pool are heavily overhung with vegetation, fish may hold there in anticipation of finding terrestrials that drop to the surface. If large rocks or logs, or other bottom obstructions rise near to the surface, they can be places where fish will hang out, too. Edges can be deep, or they may be shallow. When they’re shallow, they’re feeding lies, but if there’s depth, then it will be prime water. In the pool on the upper Brooks, one side was deep and filled with fish, the other side was shallow and offered easy wading. It didn’t take much to make the correct interpretation in that case. But what about hatch periods? Often fish will drift out into the shallow waters of pool edges and set up feeding lies in water no more than a few inches deep. I’ve walked over enough of them to have finally learned this. It pays to watch the shallow side when there’s food to move the fish. Even if the food isn’t on top, there may be drifting eggs, nymphs, larvae, pupae, scuds, cressbugs, worms, stonefly nymphs crawling to shore, sculpins flitting around on the bottom, and so on. This is especially true in the twilight of dawn and dusk, and in the after-dark hours. Then there are the edges on corner pools. Very often the outside edge is undercut or dug into the bank with a series of gouges and lumps and bumps that can offer protection from currents. It always surprises me how small a bank projection can be and still offer a lie. When I’m floating and fishing along a bank, I hit every spot I have the opportunity to get a fly into, no matter how seemingly insignificant. A large rainbow hooked along the edge of this tailout did what fish generally don’t do—it immediately turned and headed down into the fast water below, forcing me to run after it. The tailout is a feeding zone. Its shallow waters make it easy for the fish to watch the surface. During a hatch, very large fish may back out of the pool’s belly and feed quietly in the tailout. I’ve taken many good fish in the tailouts of pools the world over. Because the water is thin, the fish are spooky, so approach such areas with great caution and cast very carefully. This is one place where I greatly prefer to use a downstream approach so that I’m not tossing line up onto the slow tailout from the faster riffle water below. The shallow tailout also invites the presence of forage fish, crawfish, leeches, and other food items, and so this area is a favorite haunt for night feeding browns. A fish that is hooked here will generally run up into the deep water at the pool’s belly. Interestingly, over the years, I’ve also both read and heard the term “lip” applied to the very end of the tailout—at the point where the water leaps over into the riffles or rapids below. I guess, if fly fishing were a bit more humorously oriented, we’d call these the upper lip and lower lip. The very end of the tailout, just before the lip, is a great place for a migrating fish to rest after its run through the fast water below. It’s also a great place for them to spawn. The press of the pool’s water forces it to flow down into the gravel at the top of the riffle or rapids. This is something the spawning fish look for. In the Lake States, that’s one of the first places I look to see what’s going on relative to fish numbers and sizes, be they salmon, browns, or steelhead. It seems that the biggest fish usually grab this most ideal spawning place. So if there are plenty of fish, and big ones right at the very end of the pool, hanging right on the lip, I know it’s going to be good fishing. I’ve caught literally hundreds of fish off the lip of the tailout. My biggest lake-run brown to date came out of just such a place. Technically, all pools are “scoured” out of the channel by the currents, but what I have in mind here are those pools formed where pools would not normally be formed by an uninhibited current flow. A scour pool might be formed in the center of a riffle, for example, when a tree falls into the stream and dams the swiftly flowing currents. The currents quickly dig a deep slot under the obstruction (Figure 5.5). 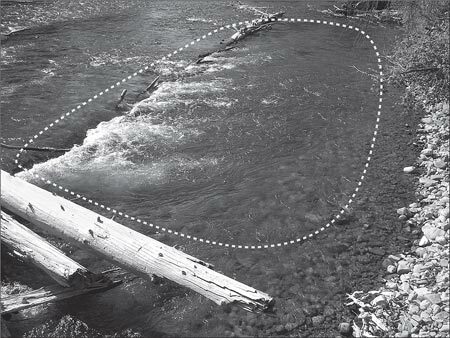 Figure 5.5 A scour pool formed by a log lying partially across a fast riffle. When a scour pool is formed by a log lying at an angle to the currents, you can be certain that it’s a great place for fish to hang out. Great because the upstream lip of the scour pool is like the upstream lip of any pool, and because the log provides overhead cover for the fish. Then again, such pools are not so great—not so great for the angler because it can be exceedingly difficult to get a fly into the prime water without getting hung up on the log (and usually all the other flotsam that accumulates on the log). Such places still deserve a good try or two, though. My favorite time to fish scour pools is when there is surface activity to get the fish on top. At such times, the best fish may drift downstream and hold in the tailout to feed. Be warned, however, when hooked they go for the cover of the log at full speed.